The Division of Global Engagement provides administrative and logistical support for UC Santa Cruz faculty to teach UCSC coursework abroad through faculty-led summer abroad programs. These programs are intended to foster relationships with institutions overseas and expand study abroad opportunities for UCSC students in a broad range of academic disciplines. UC Santa Cruz Faculty-Led Summer Study Abroad programs offer students an international experience with UC Santa Cruz faculty. These programs encompass UC Santa Cruz courses taught abroad, enhanced by the location, excursions and cultural activities. All program proposals are reviewed by the Senate Committee on International Education (CIE) and UC Santa Cruz Study Abroad and ultimately the Committee on Courses of Instruction for course approval. If you are considering a faculty-led study abroad proposal, review the Faculty-Led Study Abroad Program Proposal Guide for detailed information on the review process, criteria, and timelines. Complete and submit an online proposal form in SlugsAbroad by the deadline. Select “Create a Profile” for UCSC Faculty to log in and create your profile. Once complete, log back in to search for “Faculty-Led Program Proposal” from the list of programs and apply for “Summer 2020.” Refer to the quick guide for assistance. Faculty and lecturers are eligible to submit a faculty-led study abroad program proposal. A completed assessment form the sponsoring department chair will be required. While UCSC students have a variety of study abroad options available to them, UC Santa Cruz Faculty-Led Study Abroad Programs provide students with a unique opportunity. These programs offer students an international experience with UC Santa Cruz faculty while enrolled in UC Santa Cruz courses. Excursions and cultural activities are built into the program, leveraging the location to enhance learning. Many provide opportunities for students to visit non-English speaking countries while doing their coursework in English. Class sizes are small (12-25 students) allowing for an intimate learning environment. Faculty can share their knowledge and interest of another country and culture while at the same time work closely with students, helping shape their experience both in and out of the classroom through meaningful engagement abroad. Faculty and lecturers are encouraged to attend an upcoming Faculty-Led Program Proposal Workshop, co-facilitated by CIE and Study Abroad. Faculty-led program proposals will be reviewed by the Faculty Senate Committee on International Education (CIE) and UC Santa Cruz Study Abroad. If recommended for development by both CIE and Study Abroad, the course will need to undergo an accelerated CCI new course approval. 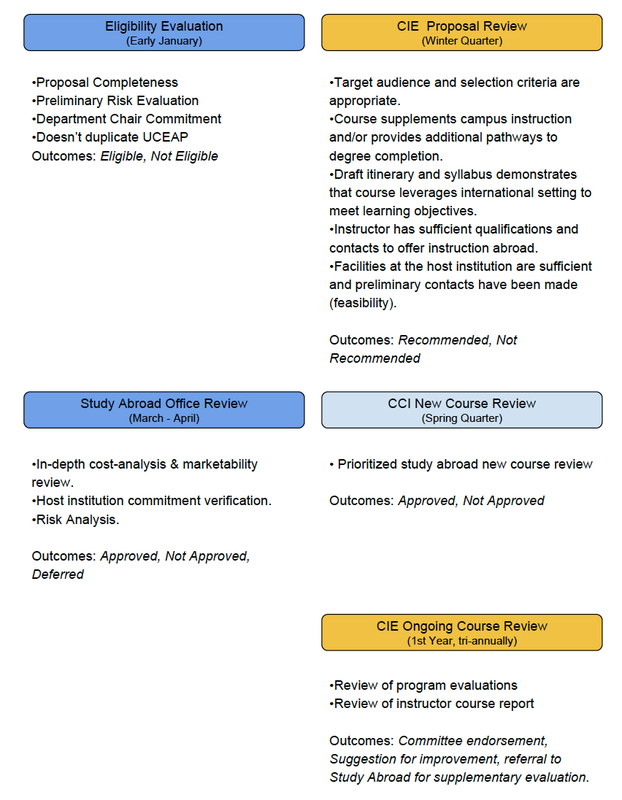 For detailed information about the review criteria, please review the Faculty-Led Study Abroad Program Proposal Guide. CIE will review proposals to either “recommend” or “not recommend” that a proposal move forward to the final stage of the review process. CIE will review proposals based on target demographics, academic quality, and feasibility. Study Abroad will conduct a final review of all proposals “recommended” by CIE. Study Abroad will review proposals based on affordability, marketability, sustainability and risk management. During the review process, Study Abroad may request a meeting to resolve any questions they have about the proposal. 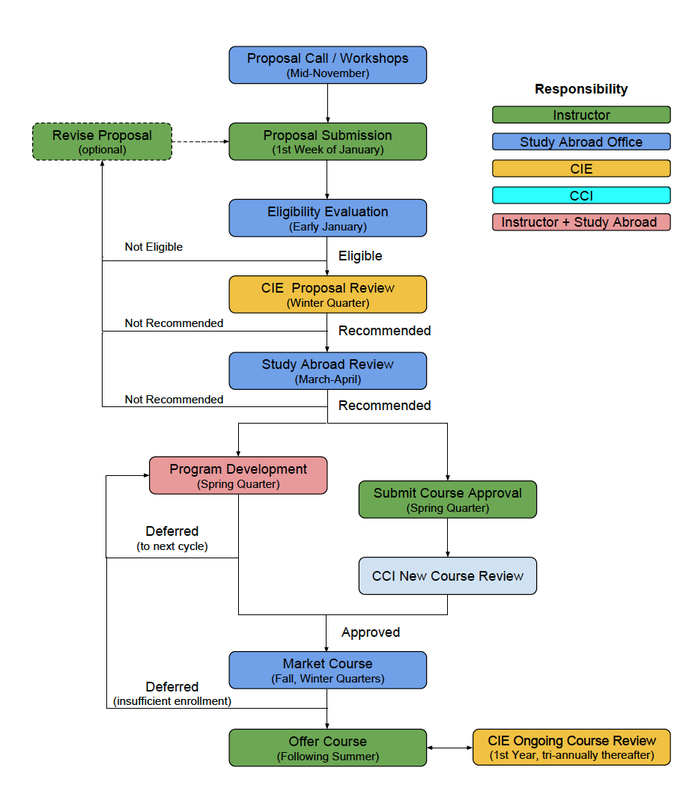 Pending course approval by the Committee on Courses of Instruction (CCI), “recommended” programs will be developed for summer 2020 implementation through a collaborative process between the faculty and Study Abroad. Faculty will be notified of their proposal status by the end of March. The Committee on Courses of Instruction (CCI) will conduct an accelerated new course approval review for the summer-session course. Consultation with CCI is recommended to determine if a new course approval or a course revision is required. Q: Can I propose a new course? A: Yes. In fact, all faculty-led study abroad program courses must be approved as new courses through the Committee on Courses of Instruction (CCI). Faculty will be notified to move forward with a new course submission following faculty-led program proposal approval. Please see the Committee on Courses of Instruction (CCI) website for more information and guidance. Q: Can I offer a course that my department already offers during the academic year as a study abroad course? A: Yes. However, faculty will need to submit a course proposal to the Committee on Courses of Instruction to teach the course abroad. We encourage you to discuss how offering this course(s) in the summer may impact enrollments in the same course offered during the regular academic year. Q: What criteria are used to review proposals? A: CIE will review proposals for target demographic, academic quality and feasibility. Study Abroad will review proposals for affordability, marketing and enrollment management, sustainability, as well as risk management. A full list of criteria can be found in the Faculty-Led Study Abroad Program Proposal Guide. Q: Will teaching a study abroad course over the summer affect my teaching load during the academic year? A: No. Summer Session courses are considered overload, and are in addition to your regular teaching schedule.